On our Asia tour, we saw Hong Kong and Beijing, but Seoul captured my heart. Exploring South Korea was well worth the time on our cruise. Celebrity Millennium docked at Busan, Jeju Island and Incheon. Busan is a financial and industrial city, with a very busy exporting port. Jeju provided a taste of rural life. Incheon is the air and sea gateway to Seoul. If Asia is the future, Seoul is its benchmark. And the main stop on exploring South Korea. Seoul is an amazing mixture of old and new. The city is clean with lots of parks and surprisingly affordable. With 10 million people (25 in the metropolitan region) Seoul feels quite open despite its high population density. Shared use of public and private resources is promoted. Public transportation and technological innovation are evident everywhere. It’s a very wired city and focused on being energetic and efficient. Customer service is king. Very international with lots of English spoken. Well educated. Competitive. Fourth highest GDP behind Tokyo, New York and Los Angeles. You see plenty of evidence of giants like Samsung, LG and Hyundai. South Korea is a fully functioning democracy and the most industrialized country in OECD. Forty years ago, per capita income was 10% of Canada. Now it’s at 70% and the middle class has thrived. Most tourists visit the Gyeongbokgung Main Royal Palace built in 1395. We arrived on a Sunday. After watching the changing of the guard, we were surprised to see hundreds of people wearing traditional costumes. The Hanbok is a 1600 year old costume that has made a huge comeback, thanks mainly to Korean youth. 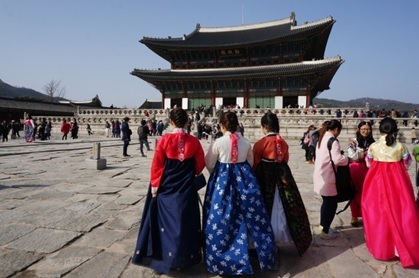 Every Sunday, young people dress up in Hanbok and then post pictures on the Internet. Big fad. But a nice mixture of old and new and very appealing. Hanbok rental shops are everywhere. In the evening, we wandered outdoor markets mixing in with Korean families enjoying an evening out. Would I go back to Seoul? Definitely. Take a tour on this Expedia video.